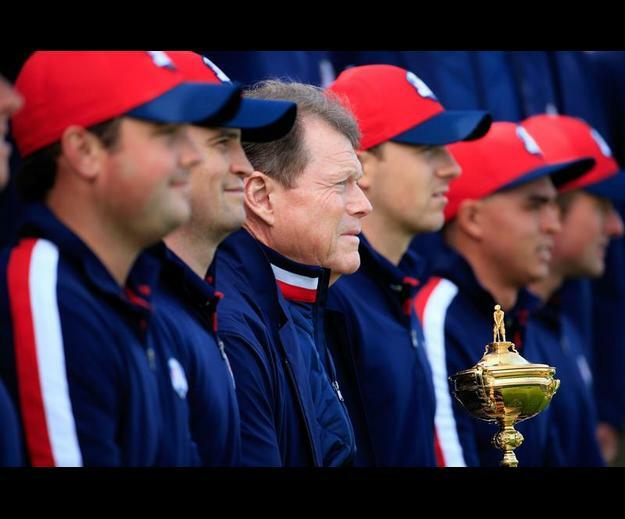 It is that sacred time that only comes around once every other year… Ryder Cup week. First of all, apologies to our moderate readership for the long hiatus from posting about the wonderful world of golf – though I must remind everyone that we did advertise said hiatus after the conclusion of the PGA Championship. Either way, with arguably one of the 5 best sporting events in all of sports, and certainly the most exciting event in the game of golf happening this week, we thought it a good time to get back into the swing of things (pun not intended, yet immediately realized). For those of you who don’t know much about the Ryder Cup, you should be ashamed of yourself, but I’ll go ahead and give a brief background. The event dates back to 1927, when the best United States golfers would compete against the best from Great Britain for a large trophy, and even larger bragging rights. With no money on the line, it was a team event with nothing more than the pride of fierce competitors at stake. Today, the USA competes against the continent of Europe as a whole, with the location trading places between American and European soil. The Ryder Cup takes place over three days, with 12 golfers on each team, and 28 total points up for grabs. Friday and Saturday consist of 4 morning and 4 afternoon team events, and a grand total of 16 points. Sunday holds 12 singles (one-on-one) matches, with every player competing, and 12 points on the line. There are also no tie breakers, and any tied match results in a half point for each side. In the end, a team needs to earn 14 1/2 points or more to win the cup. In the event that the teams finish in a 14-14 tie, the cup remains with the last team to win the event. The last Ryder Cup was held on American soil at Medinah Country Club in Illinois, and the Europeans pulled off one of the biggest Ryder Cup comebacks in history to win the cup. So this year, at Gleneagles in Scotland, the Americans will need to win outright or Europe will retain the cup. Team Europe comes in as heavy favorites with the world’s hottest golfer, Rory McIlroy, complemented by Ryder Cup great Ian Poulter, and some other European stalwarts in Justin Rose, Sergio Garcia, Graeme McDowell, and Martin Kaymer. So you see what’s at stake… Here are a few thoughts on what we expect to see, what we’d like to see, and what we predict will happen. Team USA: Jim Furyk, Rickie Fowler, Bubba Watson, Jimmy Walker, Matt Kuchar, Jordan Spieth, Zach Johnson, Patrick Reed, Phil Mickelson, Keegan Bradley, Hunter Mahan, Webb Simpson. McIlroy and Poulter served as the catalysts for Team Europe’s comeback in the 2012 Ryder Cup, thanks in large part to the clutch putting of Ryder Cup great, Ian Poulter. Photo courtesy of talkingbaws.com. Team Europe: Rory McIlroy, Sergio Garcia, Justin Rose, Martin Kaymer, Henrik Stenson, Jamie Donaldson, Victor Dubuisson, Thomas Bjorn, Ian Poulter, Lee Westwood, Stephen Gallacher. There are only three Ryder Cup rookies on each side, so many of the players will have experienced the environment at least once before. Most recently in Medinah, we saw some good chemistry on both sides from teams including Justin Rose and Ian Poulter, Bubba Watson and Webb Simpson, the emergence of Phil Mickelson and Keegan Bradley, and possibly the hottest and most talked about pair, Ian Poulter and Rory McIlroy. Expect to see each captain starting safe by pairing English teammates Rose and Poulter together again, as well as Watson and Simpson, and the 2012 favorites, Bradley and Mickelson. While the Englishmen are off and running, European captain Paul McGinley will be wise to pair Northern Irishmen McIlroy and McDowell together, despite their struggles in 2012 (1-2-0). American captain Tom Watson will probably heed Rickie Fowler’s request to play with fellow Butch Harmon product, Jimmy Walker. All of these teams will make formidable opponents, and if any combination is matched against each other, it will definitely get the action started off on the right foot. 1. Rickie Fowler and Phil Mickelson. Admittedly, Watson would be foolish not to throw Mickelson and Bradley right back out there and see if they can pick up where they left off in 2012 (3-0-0), but if that doesn’t work, I think an equally passionate and effective pairing would emerge from Mickelson and Fowler, who fed off each other so nicely in the penultimate pairing at the PGA Championship. 2. Jim Furyk and Jimmy Walker. Who wouldn’t want to see these two stone-cold killers take on a pair of unprepared Europeans, and simply out-grind them off the course? A lot of early rumors are suggesting Watson may pair Furyk, top-ranked American with 8 Ryder Cups under his belt, with Ryder Cup rookie and youngest player in the event, Jordan Spieth. But Walker is also a Ryder Cup rookie, and I can not think of a team that would match each other’s demeanor quite as well as these two. 3. Matt Kuchar and Rickie Fowler. If Fowler doesn’t get the chance to play with Lefty, I think this team could provide some great fun and some great highlights. In last year’s President’s Cup, Kuchar was trying to get the celebrations going with Tiger Woods so much that he surprised him with the Fresh Prince handshake. Unfortunately, though Tiger is many things, an cheery, animated golfer is not one of them. Fowler could be the spark that Kuch needs to get the most fun out of his Ryder Cup experience. 4. Zach Johnson and Jordan Spieth. If there is any one other than Furyk and Mickelson who can serve as a mentor for young Spieth, and keep his nervous excitement in check, it’s gotta be the impenetrable Zach Johnson. Remember these two fought in a playoff in the 2013 John Deere Classic, and Spieth bested ZJ to earn his first PGA title. An opportunity to play as teammates could spell danger to whomever their European counterparts may be. Overall, I am drinking the American Koolaid this year. Traditionally, the Europeans have managed to do better when they are competing as the underdog, so why can’t the tables be turned this year in the birthplace of golf? No one seems to be giving the Americans a chance, which is exactly why I like their chances. I don’t see the Americans pulling off a 2012 European comeback, however, so they better not be trailing any worse than 7 1/2 – 8 1/2 after the first two days. 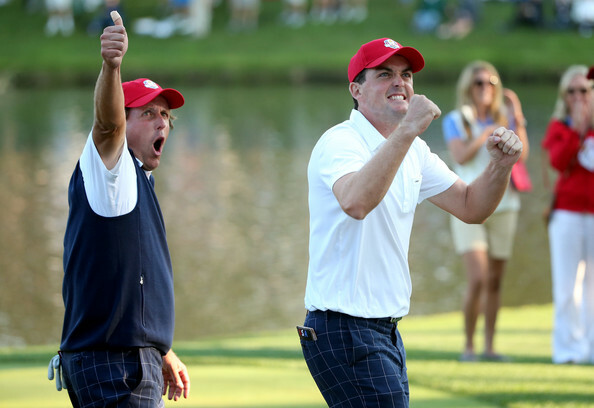 Ryder Cup Rookie Keegan Bradley and veteran Phil Mickelson were the best thing going for Team USA at Medinah. Watson will likely give them the chance to carry their momentum over to Scotland. Photo courtesy of zimbio.com. One of the biggest storylines going into the week is Ian Poulter’s position of being arguably the best Ryder Cup performer of all time with a total record of 8-3-0. I predict he will sputter a little this week with the added pressure of such a claim, but will still have a strong performance, sitting out only one event, and earning a 2-1-1 record. 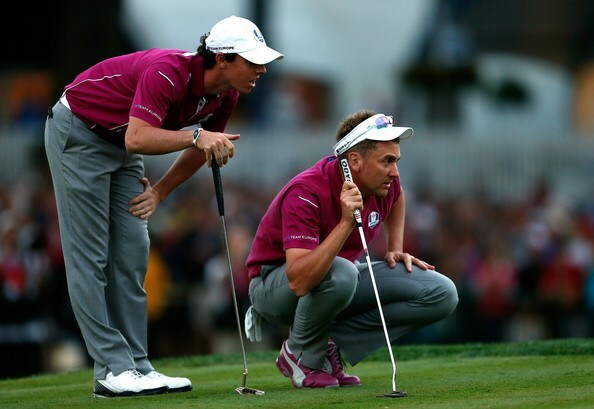 The American most likely to challenge Poulter in enthusiasm and intensity is Keegan Bradley. However, I think there is such a thing as wanting it too much in the Ryder Cup, and I think Keegan will only manage a 1-2-1 record. 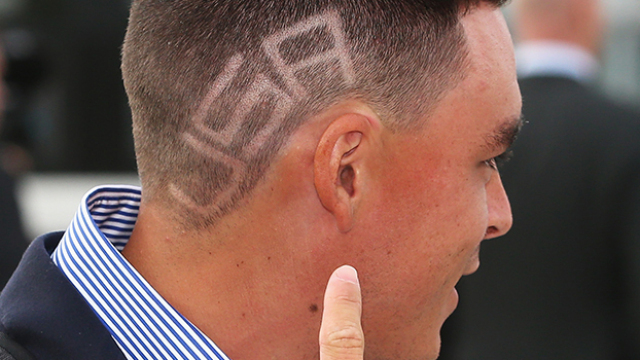 The hero on the American side, instead, will be Rickie Fowler with a 3-0-1 record. Officially, I predict the Americans will trail the Europeans 7 1/2 – 8 1/2 heading into the singles matches. We will rely on steady golfers Furyk, Kuchar, and Johnson to head out early and get us back into the match. Patrick Reed will win an important point in the singles matches, and hot players Spieth, Mickelson, and Fowler will finish things off. The final score will be 15 – 13 in favor of Team USA. Sure, this will seem like a homer pick, and maybe it is, but I can’t think of a better event to let personal bias play into professional opinion… So let’s see what happens, and let’s go USA!! !